While many of us live a largely sedentary lifestyle, the United States remains a highly mobile society, addicted to the road and high-speed, demanding daily schedules—hence, our addiction to fast food. The convenience of this food, however, comes at a high price belying its reputation as the food of the masses. The ingredients in these foods, unfortunately, make the exchange little more than murder. Some Kidney Damage with your Wendy’s Frosty? There’s little more comforting when you’re on the road than a long sip of wholesome ice cream and milk. And about a dozen other ingredients, as it turns out. You can count guar gum, cellulose gum, and carageenan (which has a checkered past) in that list of ingredients, and those are just the thickening agents. Mercury-inclusive high-fructose corn syrup and several others sugars and oils linked to high blood pressure are also present. The new Coffee Toffee Twisted Frosty includes a laxative chemical—propylene glycol—often used in electronic cigarettes and cosmetics Its Material Safety Data Sheet (MSDS) actually indicates possible skin, liver, and kidney damage with contact since it can get into our blood stream and our bodies, where it stays for weeks at a time. Some animal studies indicate cellular mutation. Admittedly, we’re not animals, and some sources say that it’s all about the dosage Our friend Mike Adams over at NaturalNews, however, says it’s more complicated, and best left out of your dessert. McNuggets also contain dimethylpolysiloxane, a kind of silicone once used in breast implants. Incidentally, they’re being phased out for the latter use due to a safety concern. Don’t be fooled by the pretty pictures of dewy lettuce leaves and the supposed farmer McDonalds bought it from. Their salads are about as fit for your new diet as is the propylene glycol mentioned earlier, which also appears in this dish along with cilantro lime and orange glazes. 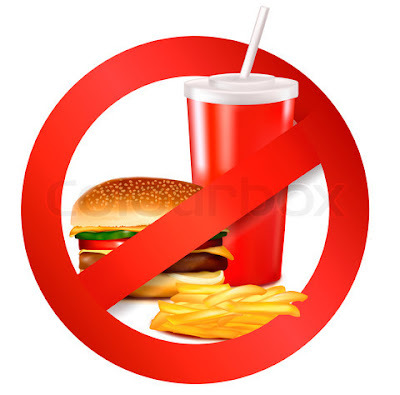 Fast food salads and dressing also often contain allergenic and possibly toxic monosodium glutamate (MSG). Even if they say there’s not MSG in their food, look again. There are lots of names for synthetic glutamates, like autolyzed yeast extract and gelatin. In the endeavor to become healthier people, we must become more informed—and skeptical—consumers. It’s true that it takes extra planning and effort to avoid fast food, but we should do so at all costs. Fatty and sugary processed foods and drinks have been accused of triggering brain damage and addictive behavior. Note: There is one Fast Food chain in Sweden that claims to have the best tasting hamburgers. There burger has been labelled an E-bomb by some because of the long list of E-number in it. Some of the E-numbers are claimed to be neurotoxins. Here's a list of E-numbers to avoid. Read the label when buying fast or processed food.